I don't watch The Daily Show very often, mostly because I don't watch TV all that often. I didn't know much at all about Trevor Noah when he took over after Jon Stewart left. I have only watched a few episodes since then, and Noah's style is very different. He's much less angry, more willing to seek common ground. That's not to say that Jon Stewart was too jaded for his job, but you could see it wear on him, every day talking about important topics but not seeming to make any real difference. I became interested in reading Trevor Noah's memoir, Born a Crime, after listening to some interviews with him when the book came out. I liked many of the things he said, and the very genuine way in which he said them. He does want to connect with people and find the many ways in which we are alike and can share moments and experiences vs harping on details that can tear us apart. I appreciate this kindness and empathy in him, particularly as he is someone who works in comedy and late night and news media that depends on ratings. 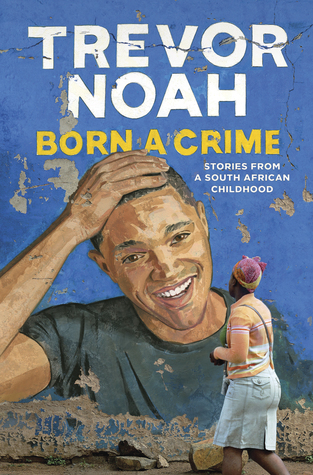 Noah's book is about his childhood and early adulthood in South Africa. It's not exhaustive; there are clearly some episodes that are quite painful and he does not dwell on those. It is more episodic in nature; the only people we get to know well and who feature prominently through the entire book are Trevor and his mother. Noah's mother seems like an amazing woman. She is deeply religious, and Trevor grew up going to multiple churches multiple days a week. She is also fiercely independent. She chose to live on her own in a dangerous city and have a mixed race child out of wedlock while living under apartheid. She raised him to believe that he could do anything. She worked and worked and worked, and when she married someone, she married an abusive alcoholic and the police never once helped to keep her safe. Honestly, having read this book, the only word I can possibly use to describe Trevor Noah and his mom is resilient. Noah grew up in a very, very difficult environment. His family was extremely poor, he often went hungry, he was a mixed race kid in a country that was obsessed with race, and there seemed to be very little stability in his life. And yet he seems never to have lost his kindness and gentleness. This book makes me want to watch The Daily Show because I want to support empathy. It makes me respect religion and deeply religious people more because when religion is done right, it really can make people strive to become better, kinder versions of themselves. I don't think I finished this book knowing Trevor Noah any better than I did going into it. I understand his background and his life better, but I do think he holds the reader just a little bit away. I think he has a lot of painful memories, and I don't think he wants to revisit them or dwell on them too deeply. Instead, he writes about events that shaped his thinking and who he became. He talks about the help he received and how grateful he is for that help and acknowledges that a lot of people don't get help. He talks about his mother and the moment he realized that women are often much more vulnerable than men in a situation. He talks about the time he realized that the police aren't always great people, that they are human and come into situations with their own histories and biases. And through it all, he shows readers (as kindly and diplomatically as possible) why he believes what he believes. People love to say, "Give a man a fish, and he'll eat for a day. Teach a man to fish, and he'll eat for a lifetime." What they don't say is, "And it would be nice if you gave him a fishing rod." That's the part of the analogy that's missing. Working with Andrew was the first time in my life I realized you need someone from the privileged world to come to you and say, "Okay, here's what you need, and here's how it works." Talent alone would have gotten me nowhere without Andrew giving me the CD writer. People say, "Oh, that's a handout." No. I still have to work to profit by it. But I don't stand a chance without it. This was an excellent book, and I bought a copy for my keeper shelf. Highly recommended. I keep hearing such good things about this book and you've tipped the scales for me. It's going on my TBR list! I'd love to hear what you think! It kept me engaged the whole way through. I think you would enjoy it, Nadia! And I definitely plan to watch at least a few episodes of The Daily Show over the next few weeks; I think I would like the more conciliatory/extend a hand approach to late night than what some other hosts are like. Oh, I am stumbling all the time, too. But I still believe it's worth striving for! I am trying to learn the difference between being kind to someone and thinking that I can influence them. Because sometimes I think that if I explain things calmly and share personal stories, people will be like - Oh! I never thought of it like that! But that does not happen. And that makes me angry. But should I disengage? I don't know! I'm just waiting for my library to get the audiobook because I would love to listen to Trevor tell his own story. I started watching him in January, along with some other commentators whose names were just words for me when I was less driven to follow American politics, and now find him an essential component of my week, in terms of dealing with the stress of current events. Like Helen above, you've tipped the scales for me now too: a keeper, then. I'm so glad you enjoy his take on current events - your recommendation is a pretty strong weight in his favor in my book. It used to be on Hulu. I don't know how I can continue watching it now that they've taken it off of Hulu - I guess there's always the clips on Youtube.